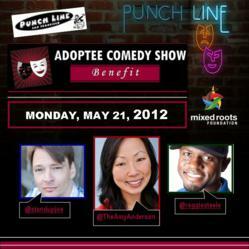 The Mixed Roots Foundation will celebrate its one year anniversary by showcasing its first Adoptee Comedy Show that will take place on Monday, May 21, 2012 at the Punch Line Comedy Club in San Francisco, CA. The Adoptee Comedy Show will feature three professional stand-up comedians who are all adopted. The show will open up with domestic adoptees, Joe Klocek and Reggie Steele both based in the San Francisco Bay Area. The headlining performance will be by international Korean adoptee, Amy Anderson who is based in Los Angeles, CA. All three adoptee comedians will be donating their time and talent in sharing their own stories of adoption as well as help raise funds for the foundation whose mission is to promote and support organizations that serve as a resource to the adoptee community, create more awareness of the adoption experience, and inspire the next generation of adoptees to become leaders in the community. “It’s very exciting to partner with the Punch Line Comedy Club in hosting our first Adoptee Comedy Show”, stated founder of the Mixed Roots Foundation, Holly Choon Hyang Bachman. “As part of our ongoing mission of creating more awareness of the adoption experience, we thought it would be fun and very fitting to feature fellow adoptee artists that can headline the comedy show. We hope those who attend will not only be inspired by the stories they may share, but will also be able to connect with others who may share similar backgrounds and experiences connected to adoption – this hopefully will be the first of many to take place nationwide”, expressed Bachman. The Adoptee Comedy Show will start with a VIP reception that will include complimentary appetizers at 6:30 p.m., the comedy show at 8:00 p.m., and conclude with a VIP Meet & Greet at 9:30 p.m. General tickets are $25 and VIP tickets are $75. All ticket proceeds go directly to promoting and supporting adoptees and their families. To buy tickets, please visit http://www.punchlinecomedyclub.com or call 415.397.7573. To learn more about the Mixed Roots Foundation, LIKE them on Facebook, call 800.659.6958, email events(at)mixedrootsfoundation(dot)org, or visit http://www.mixedrootsfoundation.org for more information.